Six months ago Graham Wilbert wasn’t thinking about the NFL. 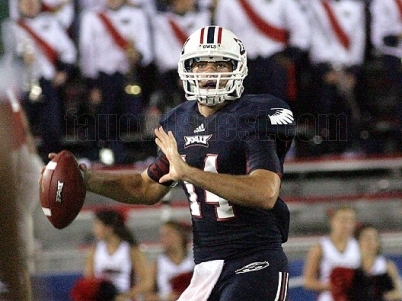 The redshirt senior quarterback was more occupied with graduating from Florida Atlantic and finding a chiropractor school rather than playing football at the next level. He was an outsider. A backup signal caller, who had lost the starting job to an underclassman after a dismal 1-11 campaign. “I didn’t really give the NFL much of a thought after my junior year,” Wilbert said. Wilbert was a square peg trying to be shoved into a round hole. He was labeled as too slow for the Owls’ new spread offense and first-year head coach Carl Pelini went with a different option for the season opener against Wagner. It took Wilbert just one half of football to prove he was the team’s best quarterback, but an exalted senior campaign to display his true trades. After throwing for 18 touchdowns and over 2,800 yards, Wilbert went from an outcast to arguably the team’s most valuable player — and NFL scouts have taken notice. With calls flocking to FAU and interest emerging in Wilbert, he has signed with an agent and decided to venture into the cattle-call process that defines the NFL. Currently ranked as the 38th quarterback prospect in the 2013 NFL Draft by CBSSport.com, many may wonder what Wilbert is doing. Others may question how a quarterback with a 3-19 career recorded is getting professional looks. That backup plan is to be a chiropractor. He's already been accepted into Palmer College of Chiropractic should it be needed - if his run at the NFL doesn't work out. But for now, he remains focused on harmonizing his hands towards the craft at playing football at the highest level. Wilbert has been training for the past month at Athletes Edge in Boca Raton and has hired Joe Dickinson to be his quarterback coach. Dickinson comes with a client list laden of success having trained players such as Josh Freeman, Matt Barkley, Terrell Pryor and Rhett Bomar. While Wilbert could be viewed as a dip below Dickerson’s top talent pool, one can’t ignore what he has endured. Having arrived on campus in the fall 2008, Wilbert saw five different quarterback coaches, three different offensive coordinators and two near-opposite offenses in his career at FAU. He witnessed a victory at the Motor City Bowl, but also the worst season in school history. When Pelini and offensive coordinator Brian Wright arrived at FAU a little over a year ago, they promptly installed a new spread offense. Wilbert by nature was accustomed to the previous pro-style system run under former head coach Howard Schnellenberger, so the no-huddle read-option scheme came to him as a foreign language. He began watching film and indulging in the playbook, but lost the battle for the starting spot in fall camp. He journeyed into the season behind redshirt sophomore Stephen Curtis and knew that he could be given a chance at anytime. So when the coaches inserted him into the season opener against Wagner, he responded with a game-winning touchdown pass. Wilbert went on to have the best season for an FAU quarterback since Rusty Smith’s 2008 campaign, throwing for more yards and touchdowns than anyone else in that span. The ability to make reads and understand the game is what NFL scouts like about Wilbert. He has the intelligence to change plays at the line of scrimmage while also making efficient throws. At one point in his senior season he had gone a school-record 250 pass attempts without an interception. Wilbert understands that his athletic ability won’t lead him to an NFL training camp, so he is investing his stock in the fundamentals that define him. Instead of focusing on 40-yard dash times and vertical jumps like many NFL-hopefuls, he is keen on working on the skills that allowed for him to thrive in his final season. “It would be nice to get involved with all the combine numbers, but when it comes down to it, I don’t think some team is going to take me because of my shuttle-time,” Wilbert said. “I’m just trying to work on my footwork and throwing the ball. Wilbert will travel to Jacksonville at the beginning of February to meet with Dickinson and begin preparation for his pro day on March 8th. In the mean time he will continue to workout in Boca Raton, and take a chemistry class needed towards chiropractic studies. “I’m really just hoping to sign as a free agent and get into mini-camp — that in itself would be an accomplishment,” Wilbert said.